This tutorial will focus on how to integrate GS Custom Settings in theme development, if you need to get familiar with regular GetSimple theming, read the tutorial in the wiki. It's also handy to keep a browser tab open on the complete template tags reference. 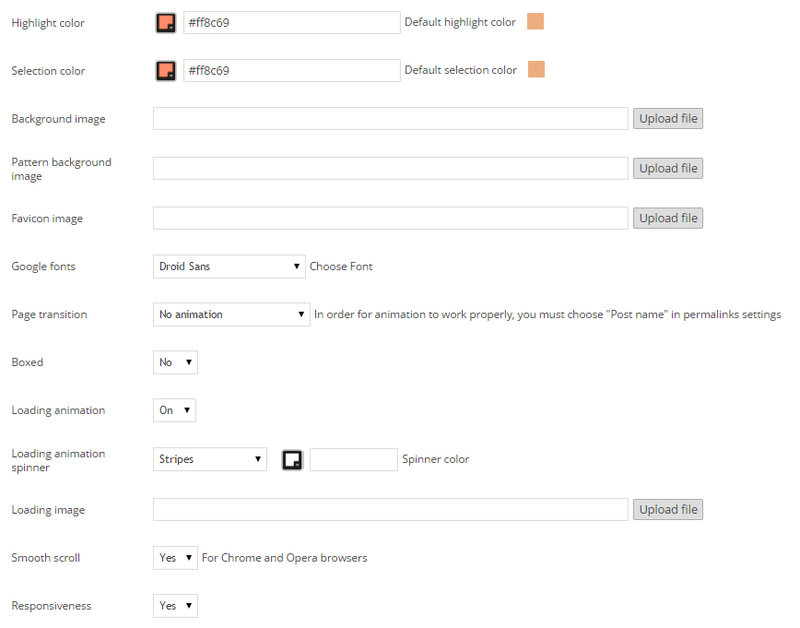 This theme requires [GS Custom Settings](http://get-simple.info/extend/plugin/gs-custom-settings/913/). This theme requires [url=http://get-simple.info/extend/plugin/gs-custom-settings/913/]GS Custom Settings[/url]. If you're using setting output in PHP for or foreach loops, it is wisest to put them in a PHP variable before the loop. Although calls to return/get_setting are not very expensive, it does save some performance. echo($string) - Outputs the given string. strip_tags($string) - Removes HTML tags from the string.Handy for example if you want to use HTML in the profile description on the page, and use the same setting for social media/ meta descriptions but without HTML. explode($delimiter, $string) - Splits a string into an array on $delimiter. Useful if you want to re-use and pre-process settings with options or fixed formats. strlen($string) - Returns the length of a string. Useful for checking purposes. date($format[, $timestamp]) - Returns a date in the specified $format. Useful for blog posts/ footer copyright/ event dates. Styling: Providing users the ability to modify theme colors, fonts and other styles without having to dig into your template, and with the option to change them over time. Output: Providing users the ability to place content in fixed theme positions (like footer content, contact details, etc.) without having to dig into your template. Data: Providing users the ability to include/ turn off certain parts of the template, like a social media widget, or whether or not to show the author name under blog posts. Meta-settings: Primarily meant for you, the developer, and usually set to locked/hidden in the interface, to facilitate version checking, include credits and links, and fixed information. Outputting content is the most basic functionality of GS Custom Settings. In the example below we output the values of the settings email, phone and address to the contact.php template. The settings are preceded by a FontAwesome icon. Note that if you want textarea settings to preserve multiple lines, you will have to set the CSS white-space property to pre/ pre-wrap/ pre-line. Conditionally showing content is pretty easy, the checkbox setting will either return true or false. The snippet below shows/hides the title of pages using a blog template, that can both be set as home or distinct blog page. Useful as you would usually not display the title when the blog is also the homepage. You may also want to hide output when a textarea/text/image setting is not set (when the value is an empty string). If the setting has no container element, you can simply call get_setting and an empty string will be outputted (note: with v0.3 the image setting will return an image with a broken link if you do this). Custom CSS is the easiest way to provide users a way to change the visual style without touching the template, but of course it requires them to go look for classes and id's in the browser, and at least have a basic understanding of CSS, so not very user-friendly. You should output this setting at the end of your dynamic CSS, so that if the user makes a syntax error nothing else gets lost. The theme will allow users to <select> one of +- 20 different fonts, including a couple from Google fonts. If you limit your font options to the websafe fonts, adding 2 extra font-family lines to the dynamic CSS like below will suffice. Generally this should also be fine if you included custom fonts in your CSS with @font-face. However, read on for Google webfonts. Theme and author info typically are not customizable and with GS Custom Settings you can (if you wish) easily keep track of them by creating some settings. If you wish to display them for users, set the settings' access to Locked. If you rather hide them, set them to Hidden. The extend_id setting might become important in the future for automatic theme update notifications in the UI. Note: With GS Custom Settings v0.4+ you might want to add a version property in the tab object in your settings.json file. GS Custom Settings will automatically update your settings (if there are any changes) when a user installs an updated version of your theme. In the code below, we (1) create 2 PHP vars $t_hfont (headings font) and $t_pfont (paragraph font), (2) get the setting with a call to get_setting and the third parameter as FALSE to output the display value of a setting (if you did return_setting you would get a number, because the raw value of option settings is the index of the selected option).. (3) With explode we split the string into an array, then in that string (4) we replace space characters with a + via str_replace. Finally, because the first 13 options are not Google fonts, we check with return_setting if the raw value of the font settings is higher than 13, and only include it then. Embedding a Twitter (user) feed is as simple as copy pasting the code from the dev guide and replacing the feed name. Also don't forget to put a surrounding if clause to test if the settings are not empty to avoid JS errors. To be able to use the feed, the user needs to create a 'widget' in his Twitter account for a certain profile, and copy paste the widget's ID and the feed's name into GS Custom Settings. To understand this part, read up on the Google Maps Static API. The output is served as image data, so we need an image tag, and a safe URL which we obtain through PHP's url_encode. The Static Maps API takes a couple of parameters for customization; here I will only include 3: the location, zoom level, and image size. Zoom levels are between 0 and 21, and image size is in the format w x h, as in 100x100 (these details can be explained in the setting description). Set Google Analytics (both classic and universal account types) from the UI with the GA ID. assign the $ga_method variable to the data_ga setting Universal analytics have a UA-XXXX-Y tracking code, while classic analytics have one more X in the middle. So we split the data_ga string in 3 parts and test if the middle part is 4 characters long. If yes, the code is universal analytics, else it is classic. output the correct tracking codes from the Google Analytics devguide page in an if else clause. Set between 1 and 5 social media links using FontAwesome for brand icons. Choose between 20+ social networks to display (if they're just text links, you could do even more). Choose the ordering in which his/her social networks are displayed. If your theme includes fixed social media providers (Facebook, Twitter, Google+ for example), you could simply use text settings for each one. But if you want to give the webmaster the possiblility to choose the display order of the social media, and give him/her more social media options, read on =). In this approach, there are 2 settings per social button: social_x defines which social network to choose for profile x, social_x_url holds the link. Basically every social_x select setting has +- 20 of the FontAwesome brand icons as options, and an extra option 'None'. You might want to read up on PHP for loops and conditional if if you're not familiar. assign the options from the first select setting to the PHP variable $social_opts. They are all the same for the 5 settings so it doesn't matter which one. create a for loop starting from 1 because the first link is social_1 and not social_0, and ending at 6 because there can be max. 5 social links in our theme and 6-1 = 5.
return_setting('theme', 'social_' . $si . '_url') if the value of the text (link) is not empty. strtolower simply converts eg 'Facebook' to 'facebook', and $social_opts is a numeric array, while return_setting('theme', 'social_' . $si) is an index, so doing the above is the same as $social_opts[x] which holds the name of a social network. choose a date format from the UI in human-readable form, and output it in PHP form. PHP date formats are somewhat hard to understand for non-technical people. They probably don't understand F jS Y as a date. Sometimes you want the options displayed in the UI to return a different output associated with that option. For text settings/ settings with limited options it's easy enough to do, but for 15+ options you might need key - value pairs. You could do this in a PHP array but you would be polluting your template. There's a 'hack' around it in GS Custom Settings: create two select settings, - one for the display and one for the return data (hidden access) -, with the same options in the same order. Note:: With v0.4+ you can also simply define a custom data property on one select instead; however you have to modify the JSON & can't use the UI. return the options (an array) from the hidden blog_date_fm setting and assign it to $date_fm_opts. Because blog_date and blog_date_fm have the same options in the same order, we can get the value from blog_date and retrieve the correct return value from blog_date_fm by doing $date_fm_opts[$date_ui].